Gasol Foundation’s main goal is to reduce childhood obesity rates through the promotion of healthy habits. We accomplish this by working in parallel with the four pillars of health: physical activity and sports, healthy eating, sleep quality and duration of rest, and emotional well-being. If a child is emotionally stable and has good mental health, that child will feel better about him or herself. Keep reading to learn more about Infantile Self-Esteem! All the four pillars (physical activity, healthy eating, sleep quality and emotional well-being) are significant and are interrelated with one another. Meaning, they must all be executed in order to obtain an overall healthy lifestyle. Take the pillar of emotional well-being, for example. If a child is emotionally stable and has good mental health, that child will feel better about him or herself. He/she will also have positive social interactions and relationships with others. The better a person feels about themselves, the more likely they are to take care of themselves physically as well; whether that’s through physical activity or healthy eating. The feeling of well-being contributes to a series of healthy habits on both an emotional and physical level that contribute to a healthier outlook on life. Also, when it comes to emotional well-being, self-esteem is a crucial element. This term is used to describe a person’s overall sense of self worth or personal value. Possessing little self esteem or self regard can lead a person to become depressed and fall short of their potential. It is important for people of all ages, especially young children, to become fully educated on emotional health and learn how to deal with self esteem issues and confidence. Learning such things at an early age can be very beneficial as as a child grows into adulthood. Their ability to learn depends on their level of self-esteem, relationships with others and on activities they are involved in. Promote responsibility: Let them make decisions regarding daily habits. For example, they can help prepare dinner, dry the dishes, assist with grocery shopping, etc. It is important that we help and teach children how to do certain tasks. There are always new things for children to learn. As your child gets older, tasks like learning to dress, read, or ride a bike provides perfect opportunities for your child’s self-esteem to blossom. Always support your child: As important as it is to celebrate the achievements of children, it is just as important to highlight their effort and level of commitment. By doing so, you will not just focus on the achievement, but more importantly on the path traveled. Regardless of the outcome, always highlight their efforts and show them support no matter what. Show them trust and love: In order for children to feel safe and secure, they must perceive that we believe in them. If we convey to them that we trust in them and trust in their abilities, they will also trust in themselves. If, on the other hand, they feel that we doubt them, they will also have these same doubts and fears. Our motto #LeadByExample takes on this full meaning when we talk about self-esteem and the well-being of the youngest members of the household. Teach them to be assertive: Correct your child’s mistakes with love and patience Try not to correct their mistakes by yelling or shouting at them. Make your child understand that you learn together and the exchange is mutual. Assertiveness is a necessary part in establishing safety and trust in relationships with children. It is also important that you respect and praise your child’s assertions. This does not mean always giving them their way. Rather, it means acknowledging their feelings and letting them know that you are present and listening. As children grow, they learn to do things alone, make decisions, make mistakes, and perceive themselves as responsible for their achievements and also, their skills and abilities. 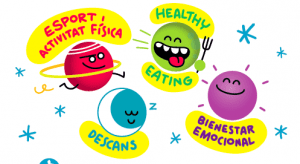 As you can see the 4 healthy pillars (physical activity and sports, healthy eating, rest and emotional well-being) are strongly interrelated with regards to the emotional well-being of children; which, in term, is closely linked to self-esteem. All of these pillars, or “planets”, are key in our Gasol Foundation “Healthy Galaxy” in which each of the 4 pillars are transformed into a different planet and where one’s welfare directly affects the other three planets.